The Great Muppet Caper is perhaps the most Muppet-ish of the Muppet movies; not the best, for it is not as funny as The Muppet Movie, nor as full of heart, nor as nuanced in its dismantling of the fourth wall. But it gets the Muppet-ness of the characters more than The Muppet Movie, and this is at least partially because it was directed by Jim Henson himself, the man who died knowing more about what special alchemy turned felt hand puppets into the Muppets than anyone else could ever hope to learn. The 1981 feature was his first theatrically-released project, and to a certain extent, this shows (there are far more moments in this film than there are in The Muppet Movie that look like an episode of The Muppet Show composed for widescreen); but it would not do to accuse the director of the dauntingly complex TV special Emmet Otter's Jug-Band Christmas of not knowing his way around a camera, particularly when it comes to favoring his little three-foot creations and making their world look natural and lived-in enough that it's genuinely shocking to stop and think about how the sets would have all been full of trapdoors and holes and the like (in this respect, the film was a fine bit of practice for the next year's The Dark Crystal, which Henson co-directed with Frank Oz, and which remains arguably the most technically audacious project of Henson's career). 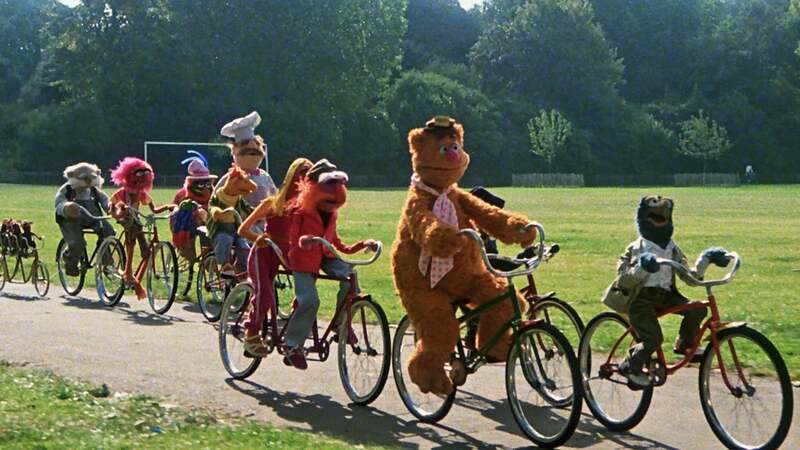 No film could better suggest the physical reality of the Muppets, although some have come closer than others. If I lead off with that observation, it's not by accident: the irritating but unavoidable fact is that, despite being a really fantastic Muppet film in visual and craft terms, frequently showing off how insanely talented Henson and his collaborators were and how ingenious they could be in times of need (a whole damn mess of Muppets on bikes, putting the single Kermit scene of the previous movie to shame; a jaw-dropping Miss Piggy underwater musical number), The Great Muppet Caper is perhaps the shallowest of the three classic Muppet films,* with the least amount of the unashamedly sappy humanism and generosity of spirit that was the heart and soul of Henson's whole damn career - odd that it should be true of the only Muppet film he personally directed, but there you have it. The Great Muppet Caper opens with the most aggressive demolition of the fourth wall that the Muppets ever attempted, give or take the Disney theme park attraction Muppet*Vision 3D (which was, incidentally, the last thing Henson directed, and the final time he performed any of his characters): Kermit the Frog (Henson), Fozzie Bear (Frank Oz), and Gonzo (Dave Goelz) are hanging out in a hot air balloon, waiting for the credits to be done. Fozzie is getting rather impatient ("Nobody really reads those, do they?" he grouses, to which Kermit sagely replies that they all have families), Gonzo mostly wants to cut the ropes and see what free-fall feels like. Eventually, after much commentary from everyone involved, the credits end, the balloon lands, and our three heroes launch into a spirited performance of "Hey, a Movie!" the first of Joe Raposo's seven original songs and maybe my favorite; I think that nobody could argue that the film's music is as wonderful as in The Muppet Movie, and there is no single piece that dominates like "Rainbow Connection", but the bright and predominately uptempo song score has no clinkers to speak of, and the relentless upbeat tone recalls, in a very good way, Raposo's collection of beloved tunes from Sesame Street. But yes, "Hey, a Movie! ", in which Kermit, Fozzie, and Gonzo inform us of how we're meant to watch the rest of the film: it's not really Kermit, Fozzie, Gonzo, and everybody else, like it was in The Muppet Movie, but a made-up story in which the three Muppets are playing characters who happen to share their personalities and names, but not at all their professions, which is how we get to the point that Kermit and Fozzie are identical twins (you can tell them apart from the hat), investigative newspaper reporters with Gonzo as their photographer. The thing that's best about this is how intensely the film insists that there's a "real" version of these three figures that is not identical to the role they're playing in the movie itself, without ever having to come out and state that it's doing so. Instead, the film simply takes as given that they are real, and the whole musical number is just there to make sure we don't get confused. It's dense as hell: post-modern in that The Great Muppet Caper demonstrates, heavily, its own fictive nature (not ten minutes go by without at least one outright reference to "we're in a movie" for the whole of the running time), and anti-post-modern in that it does everything possible to elide the fictional layer underneath the fiction of the movie itself. And while that's clever and all, it's part of the reason that The Great Muppet Caper doesn't wrench the heartstrings like The Muppet Movie, or any number of other Henson productions: it's too pleased with how clever it is. This would be far less endurable if the film weren't so funny, and so inventive, but The Muppet Movie is also funny and inventive. So, in due course, the three reporters fly to Britain to investigate a jewel thief case: fashion designer Lady Holiday (Diana Rigg) has been robbed, and the boys' jobs rely on their figuring out whodunnit. 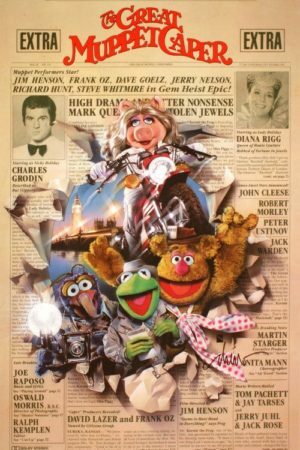 It turns out to be her brother, Nicky (Charles Grodin), and the dashed-off way that the film relates that information indicates how little The Great Muppet Caper cares about its own plot: the stuff that matters is the character interactions, primarily Kermit's courtship of Miss Piggy (Oz), whom he initially believes to be the same Lady Holiday. And, the chance to show off, and be witty, and all that. It's not very warm, but it is a lot of fun, with mercilessly punny, stupid humor blended seamlessly with esoterica and snappy dialogue, as is typical for the characters - it took four people to write the script, of whom only Jerry Juhl had any previous Muppet experience, but the results crackle along, even if the movie ends up being neither a completely airtight homage to '30s screwballs (which appears to be the case for at least the first third of the movie) nor focused enough as a mystery-comedy to work perfectly on those grounds. Mostly, though, it's Frank Oz's chance to show off with Miss Piggy like he never did before or ever did again. I am, confessedly, a Fozzie man; I enjoy Oz's porcine diva just fine, but she was never one of my favorites of the A-list Muppets. Still, there's no denying that she is magnificent in this movie: there are a solid half-dozen scenes in which Oz shows just how much you could actually get out of these puppets, whether it's the explosion of delight that she launches into upon being hired at Lady Holiday's offices, her side trip into an action movie during the third act, the water ballet that is maybe the most "how did they do that" dumbfounding thing in any of the Muppet movies, her giddily romantic performance of "The First Time It Happens", the other candidate for best song in the picture. It is too much to suggest that The Great Muppet Caper is The Piggy Show down the line, but it is a flawless vehicle for her unique personality. And that alone is enough for the Muppet aficionado to regard the film as essential; besides the which, it's awfully playful and sturdily constructed, with better running gags than any other Muppet film, and two of the all-time best Muppet cameos, when John Cleese shows up as a befuddled wealthy man with a pig breaking into his house, and Peter Ustinov trading quips with Oscar the Grouch, mostly because that is the most awesome thing that could ever be. The one thing the film cannot do is jump the gap that The Muppet Movie danced around so effortlessly: it never quite stops feeling like a kids' movie that is just swell for grown-ups, while the best Muppet projects don't even seem to notice that the kid/adult divide in entertainment even exists. But even an imperfect Henson movie is bound to have quite a lot of charm, and whatever nitpicks I have about the movie, it never stops working for even a moment.